The last 4 years have been characterized by a consistent phenomenon among economic forecasters: each year began with forecasts of strong consensus growth ranging from 3.0-4.0%. As each year 2010-2013 unfolded, however, these forecasts were gradually ratcheted down until the final, disappointingly-low revised number was quietly revealed. Despite all the go-go forecasts, 2013’s final growth rate settled down to a lackluster 1.9% — the average since 2000. 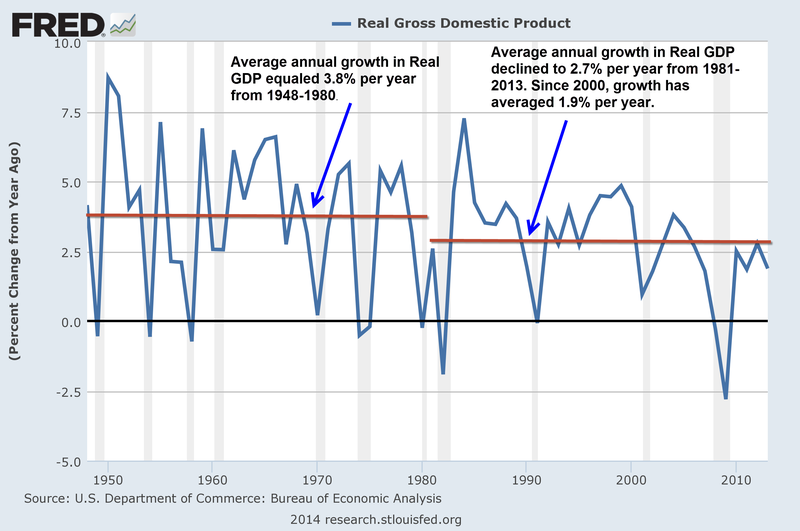 The chart below shows the annualized growth rate of real GDP (trailing 4 quarters) since 1948. The 30-year trend of slowing growth is evident in the graph. Average growth has fallen every decade since 1981. Since 2000, Real GDP growth has averaged only 1.9% per year. Despite reduced tax rates, staggering budget deficits, artificially low interest rates and multi-trillion dollar stimulus programs, this is all the growth the US economy has been able to muster. vehicle can take a leaf out of Volkswagens social media marketing book. to those with similar tastes.